In a country obsessed with cricket, Indian Premier League, IPL has managed to offer the perfect mix of cricket and entertainment. It is among the top 50 sports league across the globe in terms of revenue and the 6th most watched sports league globally. Needless to say it has become a great money making proposition for the BCCI and the participating franchisees. But how much money does IPL make? In this article we look at the richest cricket league in the . As per the latest available financials published by the BCCI, [tweetability]the seventh season of the IPL held in April- May 2014 generated income of INR 999.6 crores for the BCCI[/tweetability] as against INR 1194.7 crores the previous year. In the same period, the surplus from IPL stood at INR 127 crores. Indeed the BCCI has recorded significant revenue jump since the inception of the IPL. The first season of IPL held in April- May 2008, generated a surplus of INR 15 crores for the BCCI. The second season that was shifted to South Africa resulted in a deficit of INR 42 crores. But since the third season held in 2010, the IPL has consistently generated surplus in north of INR 100 crores. 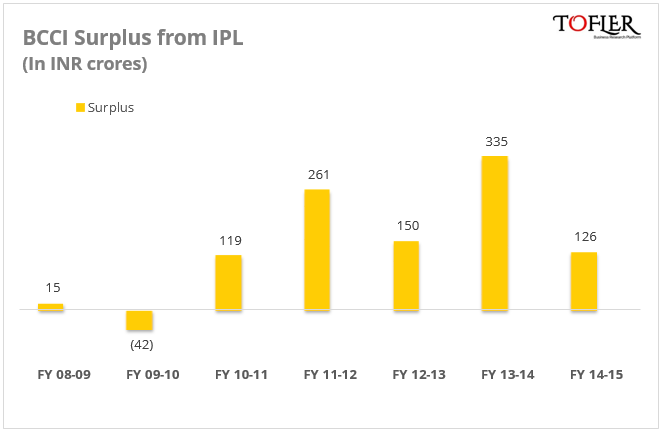 In fact the surplus alone stood at INR 335 crores for the 6th season of the IPL. [tweetability]The majority of the revenue comes in the form of central rights– the share in the IPL revenue- that the BCCI pays to the teams[/tweetability]. Apart from this, teams also have sponsorship income on completion of the terms of the sponsorship agreements which is based upon contractual amounts previously established with sponsors. Income from the sale of tickets are also reported on the income statement of the companies. Other sources include income from trading players with the other franchises and merchandise sales. The winning teams also realize revenue from the prize money from winning the IPL. [tweetability]KKR which won the IPL 7 took home INR 39 crores as the prize money[/tweetability]. A look at the financial performance of the teams would show that IPL has turned out to be a fruitful venture for them. The consistent teams of the IPL have been raking in the moolah for the promoters. The infographic captures their financial performance. Interestingly, only KKR and KXIP were in the green as far as profits were concerned in FY 2014-15. The team which has consistently been able to generate profits for the franchisee has been KKR. KKR’s revenues showed an impressive jump to INR 169 crore for the year ending March 2015 against INR 129 crore the year before. [tweetability]While KKR is the most profitable among all the cricket franchisees, it has also managed to keep the company in the green over the last four years[/tweetability]. KKR might have benefited time and again due to its association with Bollywwod stars like Shahrukh Khan and Juhi Chawla. The six-week tournament that ended in May 2014 had seen KKR emerge as the champions for the second time. KKR has a following of 14.3 million on Facebook. RCB on the other hand have had a rough ride in the IPL. The star studded team has not managed to generate big bucks for the franchisee. The income remained flat around the INR 90 crores mark. [tweetability]RCB reported revenue of INR 94 crores in FY 2014-15[/tweetability] against INR 93 crores in the previous fiscal. Their losses soared to INR 30 crores in the same period. The biggest expense for the team was the player fees, which was INR 67 crores in the period. Delhi Daredevils also saw their revenue decline after they finished at the bottom in IPL 2014. Their revenue fell from INR 159 crores in FY 2013-14 to INR 117 crores in FY 2014-15. The company also reported a loss of INR 20 crores in the period after being in the green the previous year. The profit in FY 2013-14 stood at INR 7 crores. Incidentally, in 2013 also DD were at the bottom of the points table. While not all the franchisees have been able to become profitable, there is no doubt on the money making ability of the IPL. Add to that the fact that IPL also goes beyond revenue for the promoters. [tweetability]The right to operate the franchises provides them with a platform to build corporate and brand image as a pan India company[/tweetability]. Author– Vishal, a Sci-fi enthusiast, engineer and an MBA, combines his eye for numbers with a natural flair for storytelling to churn out Tofler’s blogs.